Internullo - Taifas, Alex Celler Dub / Yellow Tail. 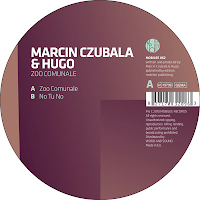 Hugo, Marcin Czubala - No Tu No / Mobilee Records. Roger Grressen - Truth. Be Told / Elevation Recordings (Ireland). Jake The Rapper, Axel Bartshch - Blam And Flow feat Jake The Rapper, Thomas Schumacher Remix / Sportclub Music. Milton Jackson - Breathe, Pezzner Remix / Neurotraxx Deluxe. Touch Yello (Booka Shade The Expert Remix) . Shades Of Gray - Whispers In The Dark / Flow Vinil. John Selway, Tony Rohr - The Last Time / CSM. Jay Bliss - Goose / Smoke City. Locus (Mark Van Hoen) - It IS Called Peace / R&S Records.